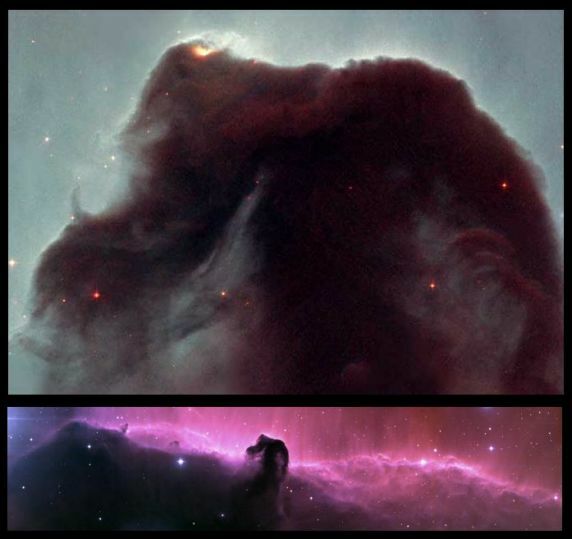 Explanation: Difficult to see in small telescopes, the Horsehead nebula was recently selected by internet voters as a target for the Hubble Space Telescope. Above (top) is Hubble's detailed view of the dark cosmic dust cloud, released to celebrate the 11th anniversary of the workhorse orbiting observatory. Below it is a stunning ground-based view from the NOAO 0.9 meter telescope at Kitt Peak National Observatory which shows the dark Horsehead against a wider edge-on expanse of glowing gas. Dramatic dust and gas clouds in and around the Horsehead are part of a large, complex stellar nursery seen towards the constellation of Orion. This star forming region is about 1,500 light-years distant and includes the well known Orion nebula. The Horsehead nebula is found just south of Zeta Orionis, the easternmost star in Orion's belt.